Aztec Legends Personal Checks are checks that can be considered "eye candy." They are very sophisticated, elegant, and the design upon the check is complex. With three colors available - green, black, and red - the design is one that portrays an Aztec soldier wearing an eagle helmet and an eagle in the background. The design is indicative of the soldier going to battle. 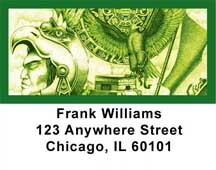 The strength of the image on the check indicates a serious warrior and a strong persona, making the Aztec Legends personal checks for those who are the epitome of strength and valor. But despite the strength of the Aztec Legends image, it does remain transparent enough in the background to make writing on the check easy to see.